Some think that life during your youth is better than it is once you gain maturity. I am not one of them. I’ve enjoyed life much more now that I have a few miles on my odometer and chips in my paint. I may not be as strong or as fast now, but I’m smarter and I know how to live. There is a down side to having some vintage on your label, though, and it relates to vision. It happens to all of us provided we live long enough. Our eyes age and the fluid in them gets a little cloudy, the muscles that shape the eye to focus get a little weaker, and the iris, the aperture that adjusts for optimum vision in different lighting conditions gets lazy. Also see: Should I Shoot with One Eye or Two? All this doesn’t have much effect on our vision under perfect conditions, but it contributes to problems dealing with low light and focal distance. Focal distance is critical when you shoot a gun with iron sights. We begin to have trouble reading the newspaper as we get older and the front sight seems to grow whiskers. This normally happens in our forties and it can wreak havoc with our ability to shoot well with iron sights. A good sight picture consists of a sharp focus on the front sight, well aligned in the rear sight, and centered in the target. Even with the eyes of a teenager, the target will lose some of its sharpness due to the eyes inability to focus on a close and a distant object at the same time. With good distance vision or corrected vision your eyes will lose the ability to focus in on the close front sight when you hit forty. 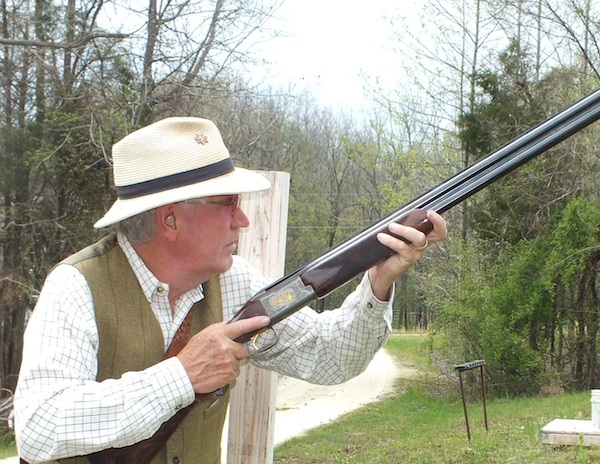 This may happen so gradually you won’t notice it, but your shooting will suffer noticeably. 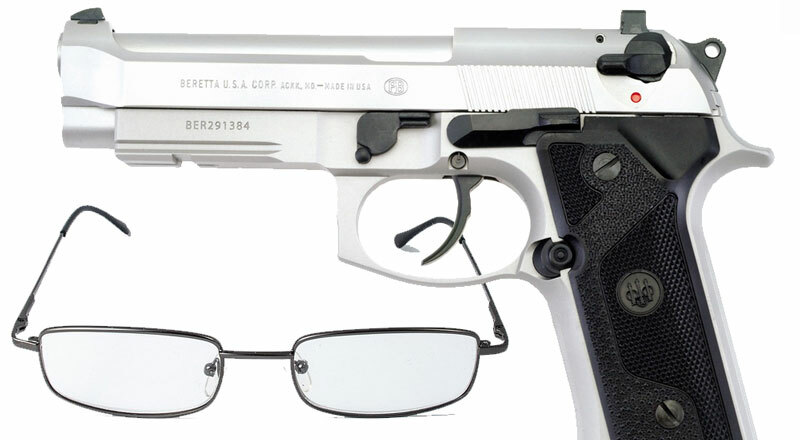 Many competitive shooters have known about this a long time and they often have glasses made with the correct prescription to allow seeing the front sight clearly. I learned this in my mid-forties shooting NRA High Power. I shot a service rifle and as I got older, I began to have difficulty seeing the front sight. I bought a set of Knobloch shooting glasses and had my optometrist prescribe lenses for the Knoblochs with +.25 and +.5 magnification over my normal distance prescription. Knobloch glasses allow easy interchanging of lenses and when it came time to shoot 600 or 1,000 yards, I checked to see which looked best under the existing light conditions. This was tricky because I needed enough magnification to see the front sight well, but I also had to be able to read the six foot number board six or ten football fields away. The small amount of magnification made a huge difference and allowed me to call shots in the ten ring, provided I got the wind right. The same applies to the front sight of a pistol. A sharp focus on the front sight affects, not only accuracy, but the ability to fire fast follow up shots as well. Having your prescription perfect on the front sight will allow you to recover faster. When the gun fires, the best shooters maintain focus on the front sight through the shot and recoil. Most shooters go through a mental reset and this often requires a refocus on the front sight which costs time. If your prescription is optimum, you’ll be much more likely to maintain focus and the process of getting the sights back on the target will happen faster. The trick in this is to use the minimum amount of magnification to be able to see the sight well. The focal distance should be beyond the front sight as far as is comfortable to allow the best view of the target. Normally, you can get by with more magnification in pistol shooting than rifle. In NRA High Power, the limit is the ability to read the number board. Last year at Camp Perry, I was still able to read the number board at 600 and 1,000 yards with +.75 lenses, but I suspect more magnification would preclude reading the numbers 1,000 yards away. OK, so now we know what we need for lenses, how do we get the lenses we need? Most optometrists will write you a prescription to your specifications and you can get glasses made to that prescription. Remember, you only need to change your shooting eye. You may want to get lenses made with a couple of different magnification levels like +.5 and +.75. Using interchangeable lens frames will allow you to match the prescription to your eye and light conditions for the day. You will be surprised how easy it is to focus on the front sight and improve your shooting. You can also alter your prescription yourself and order from companies like Zenni Optical. They offer a wide variety of styles and lens colors and are economical enough to allow you to buy two or three magnification levels and colors to allow trying more or less magnification to give you the best option for the conditions you face. Having the correct prescription will improve your shooting accuracy and speed and it isn’t rocket science. A little effort in getting your vision right will pay big dividends when you shoot with iron sights with a rifle or pistol.